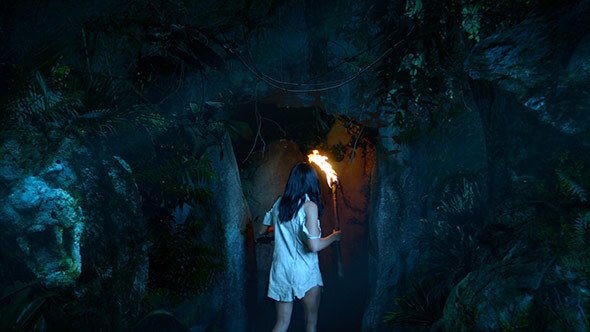 Adventures with the Queen of the Jungle and a Supporting Cast of Trained Exotic Animals Outside L.A.
Motion Theory directors Grady Hall and Mark Kudsi didn't have to travel far to turn megapop star Katy Perry into the queen of the jungle for her latest single, "Roar." Transforming a portion of the Los Angeles County Arboretum and Botanic Garden 13 miles north of downtown L.A. and sending a very game Perry high above the treetops, the directors took playful aim at the Tarzan myth by letting Perry and her message of self-empowerment ring out. Director of Photography Maz Makhani shot primarily on the ARRI Alexa and used two Red Epics, plus various Canon 5Ds and other DSLRs for extra coverage during the three-day shoot in August. The resulting video, which premiered September 5, is another world away. Every shot is crammed with visual treats, from the antics of performing wild animals to Perry's athleticism and an interactive backdrop of stunning visual effects produced by Motion Theory sister company Mirada. We talked to Kudsi, the Grammy-winning director of the Black Eyed Peas' music video "Boom Boom Pow" and Hall, director of the MTV VMA-winning "Safe and Sound" video for Capital Cities, about working together for the first time on a music video and exactly how the video's elements evolved. To get a sense of the world Perry and the filmmakers create in under five minutes, watch the video first. See below after the interview for the full credits. StudioDaily: Is this the first time the two of you have collaborated on set, and how did that work? Hall: We have worked together over the years, linking up on projects when the situation has called for it, but never for a music video. We see each other's work from across the office and we kind of know that we have some things in common and when everything lines up like this, where we know we're going to need some multitasking and there's fun to be had in partnering up, we've done it. Most of the time Mark and I work separately, so we're used to getting our own ways and expressing our complete, individual visions on screen. But there's a strange paradox that Mark and I have found when working together: if both of us are in the room, it's fluid and awesome, but if one of us leaves the room and has to do something else, there's no drop off. We both do everything and because we've been friends for a long time, it's not about anything else on set than what makes the best idea. There's no ego, no arguments, there are no issues, there are no process problems—it's really drama free. The only conflict is us vs. chaos to try to bring something to life in the best way possible. Kudsi: It's just a very, very fluid process on set. We don't have to break things up because we attack it together as things arise. But we can also, as Grady says, go off to deal on our own with whatever comes up so we can multitask more efficiently. What did you set out to do with this music video? Kudsi: The goal was to make this mini movie as big as we can and at the same time have as much depth as we can put in it. Katy Perry attracts such a wide audience that that was probably the biggest thing on our minds when discussing the concept with her and the label. We want to talk to the five-year-olds and the 70-year-olds. We had to capture something that would resonate with all of them during a three-day shoot. Mark Kudsi (left), Katy Perry and Grady Hall on set (Photo by John Shearer/Invision for Capitol Records/AP Images). How did the project first come to Motion Theory/Mirada and how did it develop from there? Hall: Motion Theory had worked with Katy Perry and Danny [Lockwood, SVP, Creative & Video/Producer] at Capitol before. Basically, one of our senior creatives presented this one line to Danny, which snowballed from there: "Katy Perry: Queen of the Jungle." Danny and Katy were involved, of course, but we developed it fully in house. The only way something like this happens is to have great people involved at every level, and that includes the artist. Katy herself is a very smart, very creative and very engaged person. And I'm sure you've heard stories again and again about how awesome and smart Danny Lockwood is as a creative force behind so many iconic videos. To develop it, we took over this giant room here and made a visual timeline with post-it notes that's like the history of the world, that engineered the story before it even started. It was the only way for us to pull together a story this complex this fast. Beyond the nods to Tarzan movies, old movie posters and classic comics, there are also a few not-so-subtle allusions to grander films and themes, like Life of Pi. Hall: We're loving it, hearing and seeing what people are saying online about the video and its symbolism. None of that is by accident, but we didn't want to completely hit it on the head, either. You just want people to experience it, to feel it as they listen to the song. Kudsi: I think because we needed to reach all the various points of her fan base we had to have more than just a simple story; adding in the subtle and not-so-subtle layered aspects of the bigger metaphors about life let Grady and I really dig into it and make it deeper than the basic storyline. But at the same time, the casual viewer can just enjoy it for what it is. How flexible were the storyboards once you got on the set? Working with the animals had to introduce a few unexpected elements. Hall: We arrived on set with a very strong plan. We spent a lot of time developing ideas and story lines, letting the best ideas rise to the top. Of course, yeah, when you are on a jungle set and have wild animals present, you know, things happen. For example, the elephant definitely ad-libbed the part when she takes Katy's dress and twirls it above her head. We knew that if we created a full environment we'd get some awesome moments with the animals, and we sure did. Kudsi: We spent about a week out at the Arboretum setting things up and made multiple trips scouting and planning all the shooting areas out. But we took a good part of the Arboretum up for those three days of shooting, from the Bamboo grove to the Prehistoric Forest and the [Meyberg] waterfall. We really wanted to start with what was there, and we added a lot to it. There was a pond there that was empty that we, with our production designer, Teri Whittacker, asked to fill up and make our own. The Arboretum allowed let us do that, which was great. The whole team did an amazing job of bringing a lot more green into every scene and taking those extra steps needed to make it highly stylized. Obviously the capuchin monkey and elephant were on set, but what about the tiger? The element of fear was pretty real, then. Well, at the end of the video, Perry is sitting there with her animal cast around her and the tiger has a contented, even goofy smile on its face. From the looks of it, the tiger was having a pretty good time on the set as well. Hall: I think we must have worn the tiger out by the time we shot that scene. Maybe it was all the jumps we had her do. She was probably pretty tired by then. Speaking of jumps, Perry did most of her own stunts. Were there any close calls? Hall: Luckily, everything went smoothly. When Mark and I first imagined the scenes, we knew that doing wire work up on a vine is a real piece of business. It may sound fun but you've got the harness and you're 20 to 30 feet up in the air. Anyone who's ever been on a high dive knows that when you're up there, the ground looks even further away than it is. And when you're being held by a tiny little cable, you're asking yourself all the time, 'Is this really going to hold me?' Katy was up there, 25 to 30 feet above some treetops, doing some vine-swinging. But we knew she was totally up for it when we were laying out the specifics of what was going to happen and she was like, 'All right, come on. Let me get up there. Let's do this!' The rigging guys are such pros, though, so we were never worried. There were no questions about her safety or anyone else's safety in terms of the stunts. It just looks dangerous. Beyond all that great work on set, there was a major effort at your sister post and editorial house Mirada—some 139 shots in the five-minute video included special effects. Hall: Teri and the whole production team did a lot on set but we also had to do a lot in post to make the middle of L.A. look like the middle of the Amazon. On top of that, they had a mere three weeks after shoot to cut, add effects and finish the video. Kudsi: That included a really intense editorial session to get things rolling. Typically you'd want a couple weeks just to get through all the footage to see what you have, but we ended up doing it in a week. Our editor, Alan Chimenti, just worked tirelessly, 15-16 hours a day, getting through that footage. Hall: I think someone took away his thyroid or something, because there's no other human way he could have pulled it off. What else, besides lack of sleep, helped Chimenti and the VFX artists meet that deadline? Kudsi: We used pretty much every piece of software and hardware imaginable! It was really important, given our tight deadline, to figure out who was the right artist and which was the right tool for each specific task in the pipeline. These aren't just operators, these are artists getting in there and making every moment in that video special. We even did hand-drawn cel animation in the cave area. From the intricate matte paintings to the more obvious visual effects, the entire effort, led by Mirada Creative Director Jonathan Wu and Visual Effects Supervisor Michael Shelton, spanned the full range of digital and analog tools available right now. They used whatever they needed to get the best out of all the moments on screen. Hall: You can imagine what it was like around here [in Motion Theory and Mirada's adjacent office spaces] for those three weeks, but because of the song's overall message, there was just such a great energy and spirit as we put the video together. There was a ton of buzz in the office and everyone is really proud of the result. Each person was essentially living the message of the video as they worked: creating a world in which finding your inner voice — and sharing that voice — is the ultimate goal. They all seemed to get that it was about finding your own gift and expressing it, so that's what they did. The senior creatives from Motion Theory and Mirada on the credits are just forces of nature. But every single person involved went above and beyond to bring it together. Kudsi: Part of it, too, was we were pushing it even more to finish an additional teaser early on in the process to air on the MTV Video Music Awards. That actually included some shots that weren't in the video. We also had an early deadline to create a one-sheet, which was hand-painted in the style of these retro movie posters that we were already nodding at throughout the music video. A lot was going on at once. But as a total package, it really came through brilliantly and each piece helped bring the concept to life. How do you recover from a perfect storm like that? Hall: You do another one! When I look at the projects Mark and I have done together, our paths cross the best when the project involves visual storytelling anchored by a very humane core. It's really easy to be energized by a project like this one, because you're sharing an emotional experience with the audience. It would be so easy to jump right into another video like that. After a day or two of the delivering the final video, you recover and you realize, this is what we do as creative people. We love to share positive things with the audience. This whole project just echoes the real message of the song in such a fun, creative way, that whether you take in the message or not, it's still a nice little mini-movie of a story that entertains. Do you have plans to co-direct another project any time soon? Hall: In a way, now Mark and I are like two tigers passing in the jungle, going off and doing separate things [laughs]. Who knows what will happen next spring. But it was great for us to join forces and share something like this with such a great team, and now, with the world.